I arrived at a place that I never thought I would be. I'm a decent reader. I can read fast. I've amassed a good reading library for my kids. I've always anticipated that they would never be able to out read me and I'd have a chance to preview what they read. (Who among you is laughing at me now?) You know what I'm about to say now, don't you? Bookworm1 is a fast reader. He's read almost everything I've collected for him so far. Of course, he hasn't read everything because, um, there are a lot of books in our house. (wink) But when he starts to re-read just about every title he's already read, I find myself in a position of needing to find something new and interesting for him. Suffering from the lack of time to preview, I'm relying on my reading friends now to point me to good authors and good stories. Amy from Hope is the Word mentioned that Richard Peck is one of her favorite children's authors and since I trust Amy I decided to keep an eye out for Peck titles. A month or so ago I found a copy of Secrets at Sea at our local used bookstore. Bookworm1 said it looked like an interesting read so I picked it up. As is the case with any book that he reads before I do, I request a little report of the book post-reading. This won't be a requirement forever (no way) but it gives me a bit of calm as he branches out on his own in the reading world. Bonus: he's learning how to write more succinctly! Now, I haven't read Secrets at Sea so I'll give you the Amazon description and then Bookworm1's. "In the beloved tradition of The Borrowers, The Tale of Despereaux, and The Cricket in Times Square, here is an irresistible adventure story about the tiny creatures who secretly live among us humans, as only Newbery Medal winner Richard Peck could imagine it. Set on a grand cruise ship to England in 1887, this beautifully illustrated tale of a charming family of mice is full of laughs, near misses, and surprises." 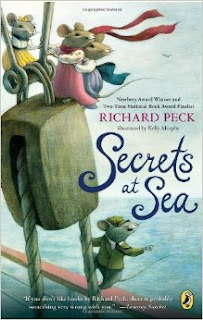 "Secrets at Sea is about four mice named Helena, Beatrice, Louise, and Lamont. These mice live in a house with a family named the Cranstons. When the Cranstons want to get their daughter, Olive, married, they board a ship for England. Wanting to see what happens, Helena, Beatrice, Louise, and Lamont then meet a mouse named Nigel. He takes Lamont away to live with him. In the end, Olive gets married, and Beatrice gets married to Nigel!" When asked if he enjoyed the book, Bookworm1 replied that he did. I asked him if he would like to read another book written by Richard Peck and he said he would. I asked him if we should keep the book for his siblings to read and he thought that was a good idea. Amy, I'm trusting you! (Ha!! No pressure, no pressure....!) Truly though, I've really come to appreciate the honest reviews and hard thoughts about books which come out of other people's corners so that I can pick and choose as wisely as possible for my children. I find that reading the blogs of others is a valuable service because I'm now finding myself in a position that many of you have already expressed yourselves to be in: being behind my children who are zooming along faster than I can keep up with! So thank you to Amy today for providing another title for him to read. I really do hope I get a chance to read it myself. It looks cute. I've read several of Peck's books as well and have been impressed by all of them (probably on Amy's recommendation, too). One of my favorites was The Mouse with the Question Mark Tail ... but I'm always up for a good mouse tale! : ) Hehehe. I don't know how old your son is, but I book that my son (now grown) always enjoyed is Andrew Henry's Meadow, by Doris Burn. It is one of the books we read together when he was quite young (maybe 6? ), and re-read many times over the years. In fact, he searched Amazon for a copy to keep in his permanent library! It's No. 1 in his "Fifteen books I've read that will always stick with me." It's an old book, may be out of print now, but you can find one. It is about a boy who feels rejected by his family (2 older sisters and 2 younger brothers). His parents are always busy, and his projects around the house get in the way of his siblings. So, he decided to take off and build his own house in a meadow a little ways out of town. Slowly, other children from the town found him, and requested to join him. He set about building custom designed homes for each of them, tailored to their individual special interests (bird-watching, insect collecting, etc.) It wasn't long before the parents began missing their children. In the end, the parents and siblings learned to appreciate each child's unique gifts and special interests. I certainly appreciate Richard Peck's books. I've had this one on my TBR list for a while. I'm thinking about grabbing the audio version from my library. Sounds super cute! And I'm so glad you're having Bookworm1 express his thoughts on books -- it really helps kids to learn from what they read.